Honestly, I think this is one of the best quotes I have heard. I admit it, I am a fan of Nelson Mandela. Don’t get me wrong, I think that he was wrong about socialism and I do know his history. But, the one thing you can’t get away from once he was in a position of power, he didn’t abuse it. He didn’t turn into those despots that are all so common in Africa. I also ask myself would I have thought differently in the same set circumstances. I do think the world lost a great man yesterday. His past wasn’t always pretty but in the end he did what he could to bring equality to millions who wouldn’t have had it otherwise and he did it through a democratic process. He grew and matured into a man that was able to accomplish things that seemed impossible decades earlier. People will quibble over whether the African National Congress was the best means of bringing justice to South Africa. They may debate whether sanctions were the right way of pressuring for the end of apartheid. One could point out that Nelson Mandela once embraced violence, but I cannot say that I would not have done the same under those conditions. He later came to realize that violence would not bring down apartheid without destroying South Africa. One can certainly question whether today’s South Africa fulfills the potential it has for freedom and opportunity. However, there is no doubt that Nelson Mandela was exactly the leader South Africa needed – even if he didn’t start out that way. He was courageous through long years of abuse and imprisonment. He was magnanimous and a force for peace and reconciliation when he was released and catapulted to the presidency. Others in his circumstances have become dictators and authoritarian leaders, exacting vengeance on their enemies. He came to be admired even by those who had once opposed him. The world has lost a great man today. Los tres locos … en la cabeza! The Supreme Court released its decision on Shelby County V. Holder. This case dealt with only one section of the Voting Rights Act; section 4. This section used data from the 1960’s in order to decide which states/counties/districts have shown acts of discrimination in allowing minorities to vote, ever. There is no denying that in sections in the country the ability for minorities to vote was made almost impossible. In many cases, those areas are in the south. But the question in front of the court was does the federal government still have the right to micro manage every aspect of how voting procedures are done in all these areas of the country close to 50 years later. They answered no. Chief Justice Roberts said that times have changed and the law must change with those times. I am not going to sit here and deny that racism exists, it most certainly does. We have heard recent stories about churches in the deep south refusing to marry inter-racial couples. But the other side to that coin is that in many of the areas that this section covered have minority voters registered at equitable numbers of their populations. Now we have all the racebaiters out in force today saying that minorities will be again denied the right to register and vote. Where is the proof of that? Many areas of the south have black representatives at all levels of government. Is that automatically going to stop simply because one small provision of the act needs to be adjusted? It is simply ridiculous. But Jesse Jackson usually is. Herein lies the problem. We are not in 1964 anymore. Times have changed and the congress was warned years ago that this provisions needed to be updated, not just rubber stamped to continue for an additional 25 years. This section actually forced the areas it covered to get permission from The Department of Justice if they needed to do something as simple as change a voting location 25 feet away. How exactly is that going to effect minorities from voting? If a white person can get 25 feet so can anyone else. In one recent instance, one small town wanted to take the party affiliation off the ballot on local elections. The Department of Justice said that was going to disenfranchise black voters. All it was going to do was make people actually research who was running instead of seeing a letter after their name and voting based on that. Since it was a very small town, most people most likely knew them anyway. But it didn’t stop the federal government from sticking their nose into business that had nothing to do with them. Congress should have acted on this years ago. Why won’t they? They are afraid of being labeled racist simply because they admit that many areas of the country no longer discriminate when it comes voting. The democrats don’t get to hold onto they are the champions of minorities and the republicans don’t want to get called names. So what do they do? They simply act like nothing has changed in 5 decades. We all know that it has. Many on the left are talking about the voting rights act has been gutted. No such thing is true. What we really have seen here is that voting rights act has been successful and it is a law that has done what it was supposed to do (the law was always supposed to be a temporary one until things leveled out) and we should be celebrating that. There may very well still be areas of the country where problems exist. Lets figure out where those areas are and write laws that make sense. If this is still such a problem, it should be no problem being able to prove it. But of course that will make the likes of Jesse Jackson less relevant. We wouldn’t want that would we? This speech changed votes. Make no mistake about that. I know people who didn’t intend to vote for him until they heard this. Some I know still didn’t vote for him on the first ballot, but did switch to him on the second. Sorry, unable to embed, but it is worth the seven minutes. You know it is Jim Crow all over again if you ask someone to show an ID before they place their vote. That is unless you are a democrat hailing from the great Commonwealth of MA, the home of the Kennedy Clan. You see the dems are holding their convention today and not only do you have to show an ID to vote, they won’t even let you onto the floor of the convention unless you have a valid ID. Paging Jesse and Al. C’mon get your marching shoes on. It is time to give hell to those racists who are trying to keep the poor and the under-privileged from voting. Another display of liberal logic. I almost feel sorry for these people. They just can’t see how hypocritical they are. Or, is that they just don’t care? The third and final debate for the GOP candidates for the Virginia senate seat was held last night. The four candidates had their chance to make an impression on the voters of Northern Virginia. For early Friday evening of Memorial Day weekend there was a pretty good turnout. This was the smallest crowd of the four debates, but it was about 400 people. The debate had a very simple format, 2 minute opening and closing statements with 90 seconds to answer questions. Each candidate was asked the same questions. George Allen, former senator and governor. E.W. 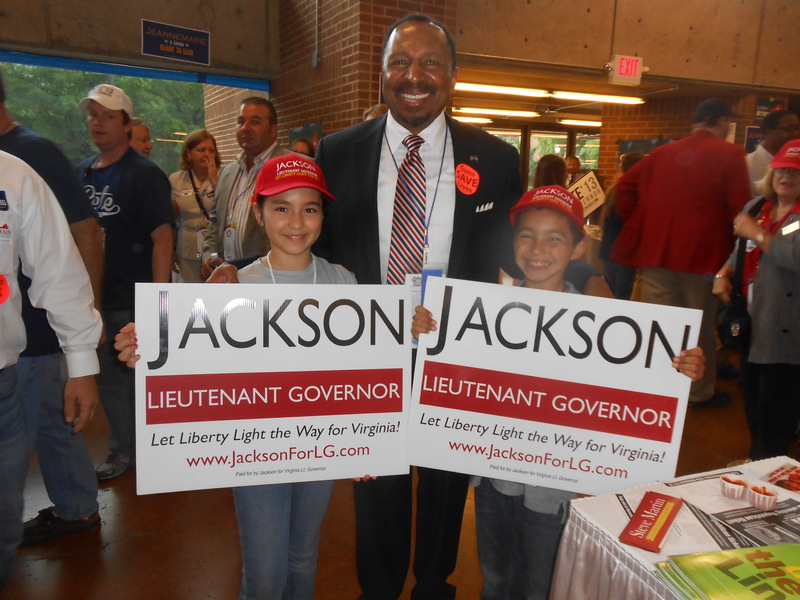 Jackson, former marine and minister. George Allen has been pretty much given the nomination by all media outlets. Polling is being done between him and the dem candidate Tim Kaine. So it is looked at as an uphill battle for the other three candidates. Some have been surprised that Allen agreed to three debates. But Virginia has a large geographic area to cover and it would be hard to find one centrally located area to give all the voters a chance to hear the candidates. So the debates were divided up by regions of the commonwealth. Allen’s plan was do no harm. Which he accomplished. I don’t think he did anything to help himself, but he certainly did nothing to hurt himself. Allen also lives in this area of the state and has strong support here. Most people I know are supporters* More on this later. Jaime’s plan was a full frontal attack on Allen. Which she did from opening statement on. Both E.W. and Bob spoke from the heart. You could tell they were not using prepared remarks and canned answers. Virginia has to take the bull by the horns. Bowing to none. If we don’t deal with spending nothing else matters. Made many references to Jefferson and abortion. Started by thanking the soldiers who died. Talked about the legacy of freedom and America’s comeback. He was trying to be Reaganesque. Now Jaime talked about not allowing congress to pick winners and losers. Which I found very interesting indeed. Jaime backed Jeff Frederick for the State Senate last year. Jeff Frederick used(s) minority status to get set aside contracts from the federal government. So that is just hypocrisy of the highest order. You can read about that here. One of the questions was meant to Perryesque and the candidates were asked which regulations they would try to do away with. E.W. being a Bishop talked heavily on the regulations being put on the Churches forcing them to go against their consciences. He also brought up the federal real estate tax that is included in Obamacare that will be collected by the IRS. He got a good laugh when he talked about how 90 seconds was not enough time. Jaime didn’t really answer the question. She talked about Dodd/Frank and closing down the depart of ed. Which I agree with by the way, but it wasn’t really the answer to the question at hand. Bob pushed a flat tax and spent his time talking about car safety and flat tax. George talked about Obamacare and CO2 regs. Which goes beyond cap-and-trade because of the all the power the EPA has taken for themselves. I would have to say one of the most interesting parts of the evening was when Bob was talking about a conversation he had with Senator Mark Warner at a college football game about Obamacare. According to Bob, Senator Warner was not worried about the constitutionality of Obamacare, or “not his first concern”. Great. We have a senator that doesn’t care if laws are constitutional or not. There were asked about what they would do about some reforms to the healthcare system they would like to see done if Obamacare is rendered unconstitutional. I would have to say that George Allen did have the best answer on this. He was stressing HSA’s. Which I am a huge fan of. I had one for years and it worked very well. HSA’s were done in Indiana on the state level under Gov. Daniels and reduced costs for the state and the employees were very happy with them. It is also the type of plan that Whole Foods offered to its employees. They work. The rest didn’t seem to have great answers to this question, but did stress federalism. Which I also am a big fan of. Healthcare reform should be done at the state level, not at the federal one. I have decided that I am supporting EW. I made that decision long before last night. But last night only solidified my belief that I am doing the right thing. Hands down he won the debate. He had the room on their feet by the end of his closing statement. The only candidate that was able to accomplish that. He also made some fans last night. Three people who I know went in being Allen supporters and left saying they would vote for EW. He is very impressive when you hear him speak. He has the ability to inspire you. His passion comes through. Matter of fact, a friend of mine and I went sign blitzing after the debate. We made sure that voters in Fairfax will be reminded of EW. Even though I am no fan of Bob Marshall I would have to say he came in second. He had very good answers to most questions. He spoke of following the constitution. I can’t really say who finished last between Jaime and George. George was overly cautious and I heard one person say that he seem “tired”. Not tired today, but in general. Jaime’s answers seemed canned and forced. She stuck to talking points and you didn’t see her, if you know what I mean. She had a game plan going in and followed it. I just question if that was the correct game plan. I will tell you if George Allen doesn’t get the nod, it will be national news. No one is really paying all the much attention to this primary. They may realize that they are making a mistake. But I have to say the grassroots is split, so it will more than likely mean it will be Allen. But I, and many other grassroots activists will be working hard over the next few weeks to show them not to take us for granted. We have minds of our own and we can be very convincing. This is race is far from over. EW Jackson for Senate. He is good and honest man. We need more of them in Washington. Or should I say we need at least one of them there. my problem with Jackson is that I do not feel he is really all that informed.I have heard him speak a number of times and he is very giftted but it is the same speech and he talks in platitudes. I find it tiring. It doesn’t impress me, I found myself staring at the ceiling because I don’t need a sweet talking person. Will he stand up against the rino’s? I just don’t have that feeling. I do think Jamie or Bob would…. He also does not have the numbers. I do like the man, but he doesn’t have a ground game. Jamie didn’t do as well in this debate, definitely a bit flat I agree but really has the ground game and numbers. Neither does Bob (have ground game), and plus bob goes off on the gay population a bit too much. Am against gay marriage but feel uncomfortable when someone morphs into quasi denigration of individuals, but he was spot on w/activist judges. I think Bob actually won the debate in terms of a tea party standpoint. I am not hopeful at this point about the primary. George was pretty dull up there and I do think people are goign to go with Jackson because they liked his oratory skillls but Jackson does not have the ground game or name recognition, he just doesn’t, so that vote is truly wasted if you really want to see Allen go away. So that is disapointing too because I am sick of people not educating themselves and falling for a pretty face. How are we any different than Obama voters then? At any rate, we have another senate seat up in 2 years. So, we can start thinking about that and get behind ONE candidate. We have to play hardball with these people and not support 3 different grassroots candidates, ridiculous to say the least. I think out of the 3 that jamie had the most organized campaign, you have to give her credit for that. But, she is no preacher, very dry so unfort personality does count. Also, the Frederick thing, that disappointed me too I supported Tito, but I don’t hold it against her. I will have no problem voting in November for any of the candidates except Marshall. There are things I don’t like about Allen, but I do think that he has had a come to Jesus moment on spending. I don’t care that Jaime didn’t support Tito. What I care about is that she always talks about not picking winners and losers when she must know that Jeff is the person she is talking about. That is just hypocrisy. I have this feeling that they have a working relationship that goes way back and that is part of her judgement process, but to me that makes it worse. She is willing to be ok with it because she knows him. I worry that Jaime can’t beat Kaine. Which is why I am supporting EW. He can draw people in. You know I don’t like cult of personality type of candidates either. I don’t see that EW is that. But I suppose I understand that you worry about that. But you are correct that the vote has been split and in two years the grassroots has to get behind one candidate and stay there. Rumor is that Warner really doesn’t like being a senator and he may retire. Who knows how true that is, but I have him on video saying he wouldn’t vote for Obamacare if it were over $1T – which it is. I will be more than happy to give that video to anyone who wants to put it on the news. He will have a great deal to answer to. If somehow Jaime gets the nod, I will work to help her win. I will have no problem doing that and I will be happy to vote for her. I don’t know if you noticed, but I was helping out EW get signatures and stuff before and after the debate. I had quite a few people tell me that they really like EW and Jaime. Don’t want them to go away. But will be voting for Allen because he is the most likely to beat Kaine. I don’t agree with that. Allen is known quantity. Everyone knows his weaknesses. He is easier for them to exploit. The unions have already announced they are going to be spending $2 million on this race. So brace yourself, we are going to be overflowing with out-of-state union members flooding Northern Virginia. If the GOP candidate can’t get 35% here, they can’t win. That is the game plan. They don’t need to go to the other parts of the state, they already know that the GOP will win the majority, but since we are the population center of the state we decide the election. Jesse Jackson on the campaign to smear Joe Ricketts. Ricketts is a Romney supporter and has funded a Super-Pac to further the cause of Romney being elected president in November. How is this man a “man of God”? Further, how is The New York Times still in business? Nothing to see here folks, just move along. The right is just paranoid idiots for thinking that there is a liberal bias in the media. Rahm Emanuel is about to experience for himself that the racebaiters of the world don’t care about your politics. He is planning on closing 17 poorly performing public schools. Not something that is sitting well with the likes of Jesse Jackson. No, Mr. Jackson apartheid is keeping these black children in a failing school that gives them little to chance of becoming a productive adult. It would be apartheid to keep them there. Jackson is under the impression that just spending more money will solve the problems. Chicago spends more money per pupil then they do for the students in the public school system where I live. We have a 90% on time graduation rate and almost 92% rate of students going onto a post-secondary education. The problems go beyond money. 15% of high school dropouts were in the jail system in the year 2010-2011 overall and rise to 25% for blacks. More than 50% of the prison population in Illinois are high school dropouts. Nearly 48% of 18 to 64-year-old high-school dropouts in Chicago did not work even one week last year. The statewide number, 42%, is not much better and is four times higher than the figure of those with bachelor’s or higher degrees. The study, based on U.S. Census data, suggests that dropouts nationally will be a net drain on the government, collecting an average of $70,850 more in benefits like food stamps in their lifetimes than they’ll pay in taxes. In comparison, the typical high-school grad will make a net positive contribution of $236,060. About 33% of dropouts will collect food stamps, twice the share of graduates, and fewer than half will own a home. And such bleak figures tend to be passed down to their children. Now, I don’t believe that every person should go to college. Some people are not cut out for it and they would prefer to do jobs that don’t require a college degree. But they will still usually need some sort of training or education in order to find a job that will allow them to live above the poverty line. While that is not true in all cases, it is true in many. So it seems that Jesse Jackson would prefer that these kids just stay in these schools, increase the odds of them dropping out and have a much harder time leading lives that will bring more financially security to them. He plans on filing a lawsuit to stop the closing of these schools. There are no words for the stupidity of what Jesse Jackson is doing. People need to wake up and realize that the likes of Jesse Jackson has lost all relevance and his ideas of what constitutes fairness not only are outdated but dangerous to the community that he says he is trying to help. This report details the costs to society as a whole in just one state. multiply this by 50% and it is not hard to see why we are broke. Our broken educational system is not just drain on us financially, it is becoming a national security issue. It was just 40 years ago that we had the highest rates of high school and college graduates in the world. We now rank at 21st. That is how far we have fallen is such a short time. Again, you not likely to see this again real soon – Kudos to Mayor Emanuel for having the courage to take on the unions and Jesse Jackson to do what is right for children instead of what is easy. If the shyster JJ is involved, then the schools to be closed must be in black neighborhoods. Is he interested in the kid`s education (cough) ? Or is his interest in the job security of entrenched unionized teachers, administrators and custodians ? As for RE doing something right, well, even a broken clock is right twice a day ! You`re #1 Rahm ! It is NOT a matter of “money spent”; it is a matter of quality of teachers and the curriculum being taught ! That’s true. But it is also because local school districts and taxpayers have little say so in how their schools (that are paid for by taxpayer money) are run today. Local districts do nothing more than hire teachers and pay for upkeep. The standards, assessments and curriculum (since it will have to be aligned to the assessments) have been handed over to Common Core consortia run by private organizations. Schools have been handed over to private companies which are not accountable to taxpayers. Rahm is just putting more control of schools into private organizations since the taxpayers and local districts have been rendered incompetent via DOEd mandates through the years. Charter school operators aren’t really entrepreneurs or free market as they use taxpayer money for the “risk”, not their own. Corporations will now make educational decisions for schools and this has been facilitated via government officials. If true local control would return to public schools, maybe there would not be so many failures. When school is seen as an entitlement instead of a responsibility by both parents and students, of course it has a higher rate of failure. DOEd has become the nanny state and the taxpayer/students are the obedient children. I get a little antsy when people throw the “corporation” card; they usually mean it in an “evil” sense. I`m with ya till that part. First, I don`t automatically throw the Good Blanket over all corporations, but if businesses are involved in ed., then you can assume they are approaching the idea from a capitalist perspective, rather than socialist, as gov. schools do now. Capitalism allows and may even depend on religious practice, while socialism seeks to rid society of non-gov. centric faith systems, especially Christianity / Judaism ! The current educational reforms are the marriage of the capitalists and the progressives. The capitalists (both on the left and the right) are making the money from education…think Gates, Rhee….and in the meantime, the progressive agenda is being pushed through via Common Core standards. And by progressive, it means not only socialistic material, it’s also designed to teach and track children so they can become workers for the global economy. That global push for global workers and tracking has been supported by both Democrats and Republicans. What I’ve been seeing in the educational reform is that there is no Democrat or Republican agenda…it’s the elitists making money off education. All the reforms are being driven by private organizations while funded with taxpayer money with no taxpayer input. That’s not really “public” education. That’s taxpayers funding private companies which make ALL the decisions (curriculum included) and the taxpayers have no voice. Question: why are conservative legislators, governors and education reformers following the educational blueprint of the Obama administration? Isn’t that rather odd? Aah, I see now; it`s “state-capitalism” ! Not true capitalism. Real capitalism made the US rich, free and profitable, while state-capitalism is making China rich without many of the freedoms. Cut out the welfare benefits from the government, entirely. Watch the parents getting the schools etc back into shape and graduating kids who can do something besides complain about how victimized they are. Side-effect: lower government budgets, if we can keep the politicos from finding some other group of potential steady voters to buy off. Naw, that won’t happen; but it made you flinch, didn’t it?? Vouchers for every student, even home-schooled ! Vouchers won’t work everywhere in the country. Please explain. Not arguing or challenging you, I`m just curious where a choice of school and the funding following the student would not work. I was thinking about it today. In my county, Haywood,NC, there are (I think) 5 elem., 4 middle and 3 high schools plus at least one Christian school, k-12. There are some homeschoolers but no charters that I know of. I will exclude the home for orphans. One of the middle / high school combos is not one many would choose to go to, as it is for “troubled” kids; those with records, on the wrong path, ordered to go there ! Other than issues of transportation, I can`t see a problem with school choice. I am calling vouchers and school choice, the same thing here. Some places are too rural. How many schools do you think are on the smallest islands of Hawaii? Are they supposed to get on airplane for another? Some places in Alaska would be the same. Not much different than in places in Wyoming, among many others. In some cases fixing the school that is existing is the only answer. Yep, that`d make changing school a very difficult, impractical thing. There`s still the alternative of home schooling for those parents with the ability ! If the student`s funding followed the child to the parents, there`d be real incentive to home school. I don’t think that is necessarily a good idea. There would be a great deal of fraud, and many kids being homeschooled by incompetent parents strictly for the money. There is no one answer. It is going to be a multi-pronged approached. One of the things that I like that they are doing in Chicago is that they are opening a high school that will have career tracts for kids who are not college bound. They do that at one of my local high schools as well. You can learn to be a hairdresser among other things. That is a good solution for some of the inner cities where going to college isn’t always attainable. I agree, no one pill for all ills. My local hi sch. still has some shop courses, welding, mach. shop, beauty/hair/cosmetics, others that get you started in a career with extended training avail. at local comm. tech. coll. for enough to get you a basic degree and decent pay. I like that approach so you can work in your field, save some cash and go on to a higher degree and better pay n stuff later. First, I want to make it perfectly clear that I feel that this case should go in front of a grand jury and let them decide what, if any, charges are brought against Zimmerman. It should not be tried in the court of public opinion. The problem is that this case is being tried by the media, the pundits, the race baiters of our country, social media, and around kitchen tables all over America. It is really criminal that this boy’s death is being used in this way. There are people with an agenda that are making statements that may very well have no basis in fact. The police have released very little information on the evidence that they have on the case. Maybe because they did a awful job investigating it or just maybe because they are doing a better job than people are willing to admit and are making sure that they are covering every base. It isn’t all that unusual for it to take time for charges to brought against someone. Police have to build a case that they believe will hold up in court. We also can look at the photos that are being used. Below is the photos that media are using. Photos that are old and paint a picture that they want to paint. They are using pictures of Tayvon that are old and make him appear much younger than his 17 years. They are using an old mug shot of Zimmerman that is a close up picture of his face that makes him look much bigger than the picture to the right of it. Media narrative. The facebook picture of Trayvon clearly shows that he was much bigger than what the media would like you to believe and that Zimmerman isn’t as big as they want you to believe. In Chicago there was a march to honor the life of Trayvon. But there was barely a mention of the people who were killed by gang violence in a city that has been overrun by gang related crime and deaths this year. 57 children have lost their lives since the beginning of the school year. The majority of them were gang related. Are those children’s lives less valuable? Don’t their parents want justice too? While African Americans comprise 13.5% of the U.S. Population, 43% of all murder victims in 2007 were African American, 93.1% of whom were killed were African Americans. Shouldn’t we be just at outraged about these murder victims as well? It isn’t that anyone is saying that Jayvon’s death isn’t a tragedy. It is. No parent should bury a child, ever, under any circumstances. It goes against the nature of things. My only point being we need to examine why this particular crime is getting so much attention and how the media is creating a narrative that may or may not be based on facts. George Zimmerman has been tried and convicted in the court of public opinion. Not only as a murderer, but a racist as well. The evidence of that is quite lacking. Black parents have some worries that others do not. They have to talk to their sons in a way that their white counterparts do not. Racism exists in this country. That cannot be denied. But not every crime that have people of different colors involved is about racism. It just isn’t. The above stat proves that. Only 7.9% of black murders are even committed by someone of another race. These numbers may not be comfortable for people like Jackson, Sharpton, and Lee to look at, but it doesn’t make them less true. We have to decide as a society if black murder victims are only cared about when they are killed by someone who is not black. It is about time we have the difficult discussions and broach the topics of why the numbers are so skewed. Until we talk about the real issues, the problems will never be solved. I know that I view the police differently than many in the black community do. I trust the police for the most part. There are bad apples of course, but by and large they do their dangerous jobs well. Many in black communities have a very different view of the police. But I do feel that is more socio-economic related than race related. I think that distrust of the police is just more prevalent in poorer communities were crime rates are higher than they are in lower crime rate areas. I have had very few run-ins with the police in my life. So from my vantage point they are doing their job keeping criminals away from my property. When you live in a high crime area you are going to see police more often. You will see people getting arrested more. You may even feel hassled if they question you because their was a crime in your neighborhood, you will also know more victims of violent crimes and you will know more people who have spent time in jail. You wonder why they are not doing more about the gangs, the drugs, and whatever else is more of a daily occurrence in your neighborhood than what happens in mine. Those are the biases that people from my vantage point and people from other vantage points bring with them when they look at this case. It isn’t about racism, it is about human nature. We look at the world from what we have experienced and seen for ourselves. Read here What if Trayvon Martin were white. A true story of white teen killed by a black shooter. A different state with different gun laws. There is an agenda to why this story is getting the attention that it is. We’re allowed to talk about cases that make the front pages around our kitchen tables (and in social media) and have been doing so since . . . what? Billy the Kid? and right up to Casey Anthony. The reason most of us are mentioning it is to defuse the race baiters who are trying to use this to spark some kind of all-out race war (it’s not an accident that the far left is on the same page and that bounties are being offered for Zimmerman; it’s all be orchestrated). The problem, for them, is that he’s not white. If he were, we’d probably be having Rodney King-style riots right now, and not localized, either (what do you think ows is for? they’re just sitting around waiting for a reason to explode into violence). And with the WH’s and DOJ’s blessing. In short, we not only have the right but a duty to try to put a stop to the lies and potential violence. Until we all stop buying into the leftists’ antiAmerican and unAmerican propensity for putting us in boxes and then trying to pit us against each other, we’re not going to see anything but highly-charged race, gender, sexual orientation, etc. accusations. We are Americans first. That has to be the first step to eliminating the actual racism that you discuss (only caring about black victims when the perpetrator is white). That’s called “equal justice,” and is miles away from “social justice” in every conceivable way. Interestingly, I hear not one word of criticism for the criminals whose activities escalated the anxiety in Zimmerman’s neighborhood to the point that the people who live there concluded that they needed to band together for self-protection because, let’s face it, the available police protection wasn’t sufficient. Those criminals, it seems, are exempt from any exhortation to search one’s soul for possible contributions to a climate in which young Martin was killed. Good point, QR (as always). The DOJ is already operating, allegedly (hmph), under orders to never prosecute crimes by blacks against whites, and with that kind of racist (truly racist, not RAAAACIST) policy in place, it’s little wonder that communities feel they have to police themselves. Well there you have it; sliced n diced like a Ginsu knife ! The only thing I can add is Spike Lee should be arrested and prosecuted for inciting the possible murder of Zimmerman ! Ok, Holder should also be arrested and prosecuted for dereliction of duty and malfeasance, to start, for F&F and declaring he would not do his job when it comes to prosecuting black on white violence ! You have no idea what is going on his head any more than I do. My only point in this post is talk about how the media is handling this case. Not about the facts of the case itself. If Zimmerman were black or if Tayvon were white we would never know Tayvon’s name. That is a tragedy and it needs to be addressed. And still more sadly if Zimmerman were black and Trayvon black, we’d never hear about it. Black on black crime is purposely (and purposefully) ignored. Although the media is all we are hearing about the case, Ask yourself was it necessary for someone to die who had no weapon. Sound like to me you have your opinion as well another black male being a ganster and the white man being innocent. Only one person had a gun and only one person ended up dead! It is a real shame that you have not bothered to read everything I wrote about this. That isn’t at all what I think. That kid shouldn’t be dead. I feel that the only reason that race was bought into question is because of a statement made by Zimmerman to the 911 operator..“This guy looks like he’s up to no good, or he’s on drugs or something. It’s raining and he’s just walking around, looking about,” Zimmerman told dispatchers. “These @!$%#s. They always get away.”(http://ibytes.net/florida-justice-department-and-fbi-will-review-death-of-tayvon-martin-washington-times/) Other than that race SHOULD NOT be the issue, the issue is whether or not Zimmerman can clearly justify his actions of killing this young man whether Treyvon was white, black, yellow, orange, green, blue, polka dotted, stripped or a combination of all the above. The law that Zimmerman is trying to hide behind does not apply to his action point blank period!! It was not Treyvons fault that other people do not know how to act and that they made that neighborhood be on such high alerts. My neighborhood is not a bad neighborhood by any means yet I still have a neighborhood watch. If Zimmerman did receive any injuries to his person than that should be expected. Doesn’t Treyvon have a right to fight for his life especially when a strange man comes up to him with a gun?!? Whether Zimmerman is racist or not the fact is that he killed a young man for no reason other than trying to play cop and for that he needs to be punished. And then let me know if this case should REALLY be about racism or not. Fast forward to 2012 to the republican debate being held on MLK Day. Apparently memories are short. Hypocrites. This is the Vision Statement for the Dr. King Memorial that recently was dedicated in Washington, DC. You read this and then listen to the statements by “black” leaders talking about Herman Cain and you just have to shake your head. Jesse Jackson watched Dr. King die. 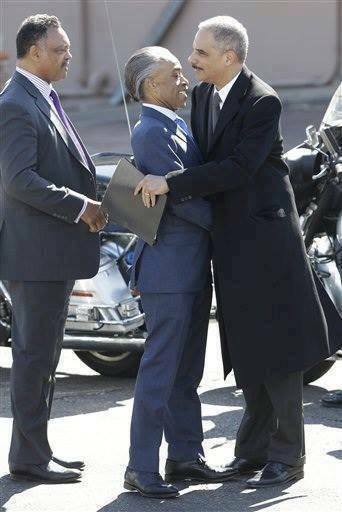 Al Sharpton seems to liken himself to being the next generation that is keeping Dr. King’s legacy alive. What a shame that have totally missed his entire message. They are too steeped in victimhood to see that Justice Clarence Thomas and Herman Cain achieved exactly what Dr. King wanted them to achieve. They found dignity in their belief systems and have the courage to stand by them, even when the race baitors of the world try to tear them down. Even in the mid-`60s when Dr. King made this “Vision Statement”, some blacks misunderstood or mistranslated it to mean more of an empowerment thing, an opportunity to revolt. It was scary then, and has only gotten worse. Some of his own people didn`t hear what he really said ! The message was hijacked almost immediately !